Execs and luxury cars | What Car? 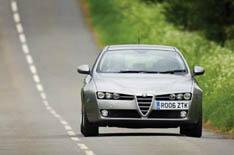 Alfa 159 Dealdrivers.co.uk has dropped the price of the 3.2 JTS V6 Lusso by 2340, bringing the price down to 24,550. You can also get 1911 off the 1.9 JTDM 16V Turismo. Lexus IS Go to Dealdrivers.co.uk for a 4408 saving on the 250 2.5 Sport. The price you'll pay is just 23,469. Volvo S60 Drivethedeal.com has slashed the price of all S60s by more than 20%. That means you can pick up the 2.4 SE for 17,977, or the 2.0T SE for just 15,534. Audi A6 Internet broker Uknewcars.com will sell you a 2.8 V6 FSI SE saloon for 24,758. That's a saving of 3107 on the list price. Mercedes CLS You can save 3634 on the 320 CDI at Motorlogix.com. That brings the price down to 42,621. Volvo S80 Drivethedeal.com has some cracking deals on Volvos this month. If you're in the market for an S80, you can save yourself a whopping 27%. That brings the price of the 2.0D SE down to just 17,644. BMW 7 Series The best deal we found was 56,320 for the 750i at Carfile.net. That's a very reasonable 6130 less than the brochure price. Jaguar XJ Buy a 2.7 TDVi Sovereign from Drivethedeal.com and you'll save a whopping 11,620. That brings the Jaguar's price down to 39,837. Bear in mind that it's being replaced soon, though. For the very latest new car deals, click here.